Cute food ideas are some of my favorite finds around blogland. Which is why sites like Little Nummies, Edible Crafts, and Cute Food For Kids are some of my favorite sites. 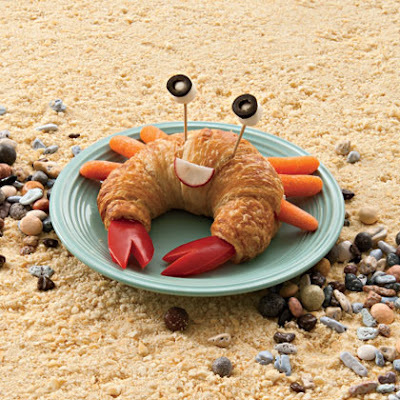 Family Fun is a good source for easy food crafts for kids, like this super cute crab shaped sandwich. I might even be able to get Ruby to eat her lunch if it was this cute. Either that or she would just tell me she was afraid of crabs. You can get the tutorial for this cute sandwich (and throw yourself a beach themed lunch) HERE. Too cute! I have gotten some great birthday cake ideas from Family Fun. The Campfire Cake was a huge hit! Oh my gosh I love this!! I'll have to try it out on my boys. what is the claws made of? The claw is red bell pepper. You can check out the full tutorial over at Family Fun.